The Beach Glass impales both sand and water with good spirits. 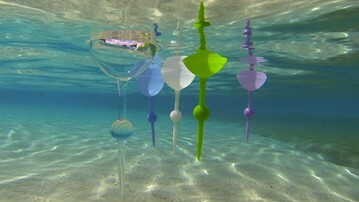 A series of spike-bottomed drinkware for wine, beer, cocktails, mocktails, and plain ol' sodies, Beach Glasses are designed to dig into the sand and turn the whole beach into your cup holder when you're lounging in the sun, and then float along side you at the water's surface when it's time to take a dip in the ocean, lake, or pool. The Beach Glass is made of shatterproof, reusable acrylic, and can also set up shop dug into the grass and snow, or positioned in one of the company's specially designed serving and storage trays. Use Beach Glasses instead of breakable wine goblets and tumblers that sink like a brick at pool parties, campgrounds, picnics, outdoor concerts and weddings, and on fishing trips. This is the original Beach Glass. A nice 12-ounce globe ready to bear down, bob around, and help you get your wino on. The glass is made of BPA-free acrylic, which Beach Glass touts as much lighter and stronger than glass. While Beach Glasses are shatterproof, they can break, but if they do, it's more like a few large chunks to clean up, rather than an explosion of tiny shards. The Beach Glass is dishwasher-safe. No more red Solo cups trashing up the shoreline. The Beach Glass' Caribbean line takes the curves out of their original wine-style glasses to produce a more masculine beer-and-margarita-ready tumbler. The Caribbeans are also made of acrylic and hold 12+ ounces of drink. They come in 4 colors. For those who want to drink bubbles on the beach, and make sure everyone knows they're drinking bubbles on the beach. The Beach Glass Champagne flutes shown here come in a set of 4. Their spikes are the same as those on the still wine glasses, but due to their pretentious flute shape, these glasses cannot float. The Beach Glass Server holds up to 4 original Beach Glasses for delivery from bottle / blender / shaker to thirsty hands and porous sands. You can also use the server to store your glasses, or set them on a surface that doesn't take kindly to having a spike driven through it. The Beach Glass Server can also hold other types of traditional stemware, but cannot accommodate the Beach Glass Caribbean line.